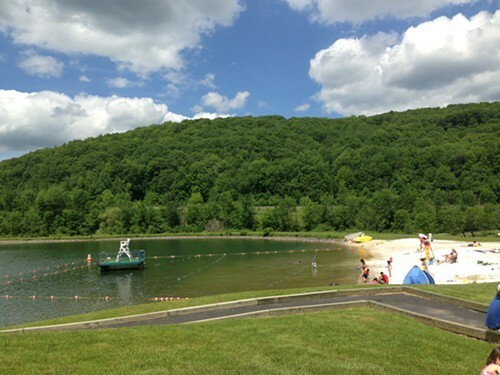 Belleayre Beach at the lake at Pine Hill is one of my favorite places to take the kids on a warm summer day because even when it is very crowded, the ambiance still feels mellow. It's our little piece of paradise. There is something very timeless about it. I love looking out at the diving dock even though I haven't jumped off of it yet. It is the place where I'll bump into a mom I know. It is the ideal place to be when the temps reach 90 and above because it always feels breezy there. We went for our first family outing of 2013 on Saturday, June 8. As we were pulling in to the parking lot, I only saw a few people on the beach. I panicked thinking that maybe I got the opening weekend date wrong, but in fact, it was just not that crowded. This season they started accepting credit cards at the snack bar, which I was pretty impressed with, and my cell phone worked there too. After your swim, you can have a picnic, barbecue, unwind on the playground, rent a paddle boat, and of course, there are many pretty photos to take! Park your car for $8. Visit Hudson Valley Good Stuff more ideas on where to eat, play & recharge your spirit in the Hudson Valley.